OK, we all know Thanksgiving is super messed up. I mean, what are we celebrating? Genocide? In the best case: that we're not the folks who get to be elsewhere or on fire or devoured by bees today; instead we get to eat until we're sick with people we're coming to terms with hating. So if you want your genocide celebration to at least reserve some of its bile for the genociders, here is a recipe that makes a great side or alternative entree. This year, let's roast a pilgrim. The first thing you want to do is remove the cap from the eggplant. When you've done that carefully peel the first 3 inches or so of skin from the narrow end of the eggplant. Keep the skin intact as much as possible, and reserve for later use. Now that you've warmed up a bit, get right in there with a knife, twisting around to dislodge a decent plug of eggplant meat. Then turn the eggplant over and get in on that other side. You want to get rid of all the seedy goo on the inside and make a tunnel all the way through, leaving just enough meat to hold the vegetable together as it cooks. Reserve the "plug" from the thick side of the eggplant. Cut a small ring from the thick side of the eggplant. Roll the sheet of skin reserved from Step One to make the main body of the pilgrim's conical hat, then slip the ring around it and set atop the peeled end of the eggplant. Also make a face out of small bits of bell pepper. Yours does not have to be this delicious. At this point we should probably worry about what's going inside this thing. Or maybe we should have worried about it before. Oh well! You can really use any pasta/sauce combination that suits you, you just don't want it to be too saucy; use more noodles than you usually would and add a pinch of salt to compensate flavor-wise. We went with a short-noodle pasta in tomato sauce with sausage and pancetta, because we thought it would look like guts, but there's no reason you can't do a vegetarian version, or alfredo-based, or any other mod you can think of. Once you've decided on your stuffing, and like, made it, it's time to stuff your pilgrim. At first you can just spoon it in, but eventually you will probably have to push on it; your goal here is to get it full all the way to the opening at the other end of the eggplant. It's not a pilgrim without its stupid little belt thingies, so we better work on that. Grab a couple slices of bacon, the real nasty fatty kind. 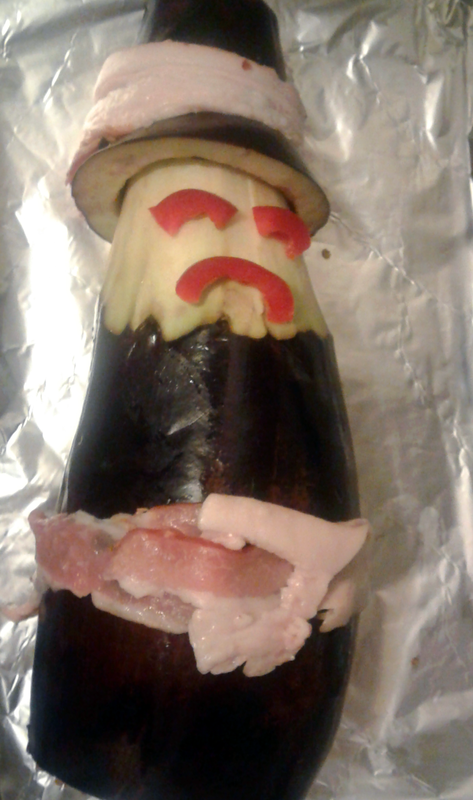 Rub it all over the eggplant (control yourself) and then wrap it around your pilgrim's hat and midsection. If you are a badass artsy type, you might want to fashion a bit of it into a belt buckle. Probably not though, this is a lot to live up to. Once your pilgrim has been fully prepared it's time to slip that plug back in and put him in the oven. Right before sticking it in the oven, turn that frown upside down! Let that little mother roast for about an hour in a greased and foiled baking pan, removing when the bacon is crisp and the eggplant is tender. Now, it is time to let the world behold your dark handiwork. Go post it to facebook. Don't worry, we'll be here when you get back. We don't even care that you didn't tag us. After letting it rest for 5 minutes, use a bread knife to cut your pilgrim into one-centimeter-to-one-inch slices to serve. Excellent on its own or accompanied with ajvar or marinara sauce. Newer PostExtra Life 2017 - UPDATE: raffle results & more! Older PostWe rebuilt the site. Again.